Learn the secrets behind today’s most rapidly growing niche publishers. 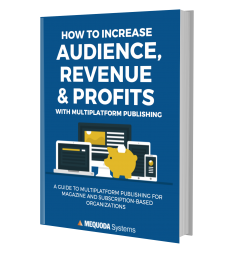 Download a FREE copy of How to Increase Audience, Revenue & Profits with Multiplatform Publishing, a guide to multiplatform publishing growth for magazine and subscription-based publishers. Where were you in your publishing career a decade or so ago? Were you excited about the Internet and its impact on our industry? Did you see a clear path forward, on your way to making millions in digital magazine publishing? Probably, like most publishers, you felt both optimism … and fear. I hope you succeeded in paving your own path. I know most publishers did not – at least not yet. And today, much to our surprise, we have an even bigger challenge: the new world of digital publishing which includes digital products and delivery. If you feel like you’re straggling behind your competitors, How to Increase Audience, Revenue & Profits with Multiplatform Publishing is written for you, and it’s not too late to read and get ahead of the game. If you’ve attended any of our events, or just read our blog regularly, you know we live and breathe the “Mequoda Method” to help publishers achieve multiplatform publushing success in the digital age. In this FREE downloadable special report, How to Increase Audience, Revenue & Profits with Multiplatform Publishing, you’ll learn all about it. Mequoda didn’t invent this Method. We’ve simply been observing, monitoring and documenting the publishing industry for decades and have organized and codified the successful strategies of publishers who developed the “method” by instinct. We’ve turned these strategies into a finely-tuned system that we teach at our events and build for our publishing clients. We have more than 50 live websites using the Mequoda System that we monitor, and are aware of dozens more that use all or some of the best practices in the Mequoda Method. Do you want to know how the most successful niche publishers have grown so rapidly in a period of such turbulence in our industry? The outline of all these strategies has been boiled down into this report. It delivers a proven, integrated set of business processes and principles for you, whether you’re B2B, consumer, local, regional or national; multi-title or single. You will learn how to double your magazine circulation and your revenue. And you’ll learn new strategies for your content, brand and revenue generation that will help you double, even triple your revenue—as it already has for dozens of publishers we’ve already helped. Now is the time to learn from what some describe as the industry’s most comprehensive set of multiplatform publishing strategies and leverage them to increase your revenues by 20% or more. When you read How to Increase Audience, Revenue & Profits with Multiplatform Publishing you’ll discover how to drive traffic, turn casual visitors into an engaged audience, and finally to sell you content products in multitudes you’ve never imagined before. If after you’re done reading, you’d like to talk more about how to put the Mequoda Method into practice, let’s schedule a time to chat. PS: Our clients pay handsomely to gain access to the Mequoda consulting team’s expertise. But when you read How to Increase Audience, Revenue & Profits with Multiplatform Publishing, you get the outline of our proven methods all in one place, to read and reference any time you need it. PSS: Remember, as I explained above, multiplatform publishing is the perfect opportunity for independent publishers to capitalize on the digital publishing revolution. This is a time in history that you can’t afford to let pass you by. As soon as the downloading and install procedure mores than, the paid application on the option of the user is to be accessed. This will call out for settlement.